Many people choose to buy furniture and other goods on credit because they cannot afford to buy it in cash. Buying on credit means you enter into a contract with a shop that allows you to take your goods home and pay instalments every month until the amount is paid in full. This is called hire-purchase or HP for short. When buying on hire-purchase the price that you pay for goods is higher than when paying cash - sometimes even double the cash price. This is because interest is added to the hire-purchase price. every month. But they should be made aware that things could go wrong, which may prevent them from paying every month. This could lead to their goods being taken back by the shop or to them being listed at the credit bureau. A death in the family, illness and losing a job are some of the problems that could prevent a person from paying instalments. 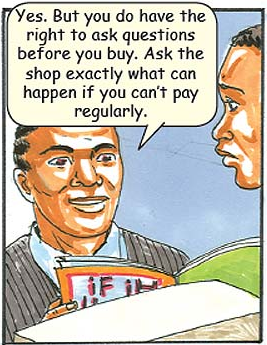 Before buying, ask the shop to explain what could happen if you are unable to repay your instalments. You have the right to ask questions and to understand exactly what is written in the contract before you sign it. Many people who buy on credit think that once their goods had been taken back, their problems are over and they don’t have to worry about paying the outstanding money. There is more bad news. If you don’t pay, you are still going to be listed at the credit bureau. You will remain listed until you pay the full amount you owe or until the required time of your blacklisting ends. As from the 1 June 2007, the Micro Finance Regulatory Council will become the National Credit Regulator under the new National Credit Act. The purpose of the Act is to protect consumers from credit givers and to educate them about their rights. Credit givers will no longer be allowed to call people offering them the opportunity to buy on credit without checking properly if they will be able to repay the money. Simple and understandable language must be used in credit agreements. Credit givers must give detailed information about the cost of buying on credit when advertising and marketing their credit options. Credit sales at a person’s home or workplace is now strictly limited. When someone applies for credit and it is not granted, reasons must be given why it was not granted.